Jungle Jim El Dorado is a jungle-themed 25 line slot invites players to venture into the undergrowth in the hopes of tracking down El Dorado, the lost city of god. Join Jim for a trek in search of untold riches with a free spin bonus where consecutive wins can unlock a mammoth x15 multiplier. Players will immediately recognise the quality of the graphics and sound effects that have become synonymous with industry veterans, Microgaming - play the latest online slots today! Microgaming is an award-winning online game developer that has blazed a trail in the industry since the beginning. Although headquartered in the Isle of Man, Microgaming has transformed the world of online gaming since their inception in 1994 and can be credited with setting up the very first online casino, the Gaming Club. Part of the reason behind this developer’s stellar reputation is undoubtedly its ability to continuously innovate and lead from the front. Deposit and play UK slot games now! 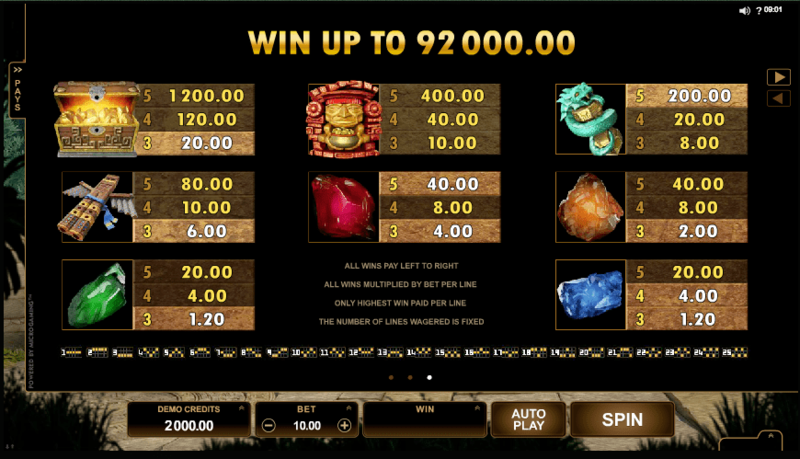 This game combines classic features such as a free spin bonus and a multiplier trails with Rolling Reels and 25 lines to keep even the most intrepid players on their toes as they enter the jungle-themed slot. 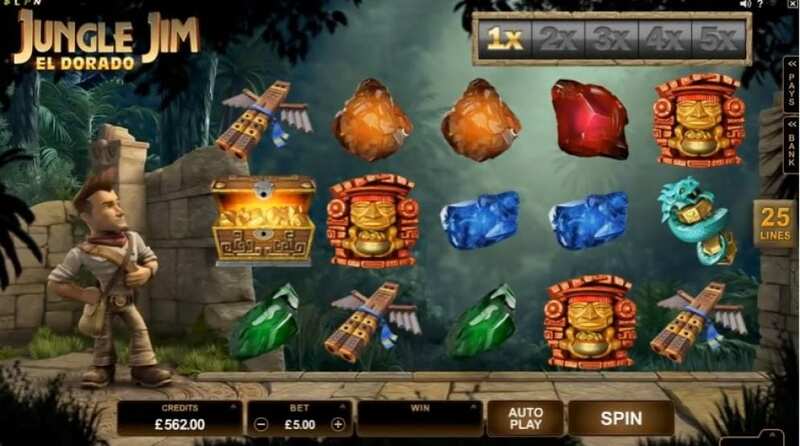 Basic symbols are gems including ambers, emeralds and rubies but it’s the premium symbols Jungle Jim wilds that will unlock the riches of El Dorado. Visit this guide to help you when you play today! Rolling Reels -Rolling Reels are a new spin on the traditional online slot format. Winning symbols explode to allow new symbols to drop down from the jungle canopy in a manner reminiscent of Tetris, giving players multiple chances to win big. Multiplier Trail- Those on the hunt of El Dorado’s riches will enjoy the multiplier trail which increases with consecutive wins up to x5 in the base game and x15 during the free spin bonus. Free spins - 10 re-triggerable free spins can be triggered at any time during the base game by landing three scatter symbols on rows one to three. Once in play, the Multiple Trail begins at x3 and increases up to a huge x15!